Dynamite Entertainment today released images and information concerning more great comics and collectibles featuring the She-Devil with a Sword - Red Sonja! Shipping in July, The Adventures of Red Sonja Volume 1 is now available for PRE-ORDER from your local comics shop. "These are the formative tales of the mysterious Red Sonja," explains Dynamite Spokesperson J. Allen. "Featuring the best writers and artists of their day, these are the stories that help set the foundation for the modern version of Red Sonja that we're telling monthly in our new series. This book is a MUST for any fans bookshelf." 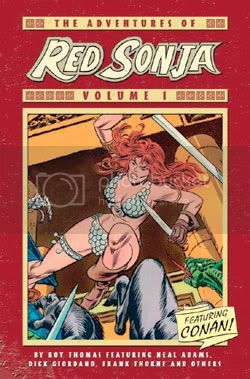 The upcoming TPB will feature the first seven Red Sonja tales from Marvel Feature with each page completely re-mastered. Colorist Jose Villarrubia will be specifically re-mastering Neal Adams story for this collection. The two covers, each featuring art by legendary artist Frank Brunner, will be available with an exclusive edition for comic retailers. The covers shown are not final cover designs. Containing the Red Sonja tales from Marvel Feature #1-7, these tales are where it all begins, and help set the stage for the current Red Sonja series from Dynamite! This is a must-have collection of never-before reprinted material. Plus, this volume will feature covers by legendary artist, Frank Brunner!. Plus, legendary Red Sonja writer and form Marvel Editor-in-Chief, Roy Thomas, provides an introduction!